Can you use WSO over a watercolor that has fixative on it? 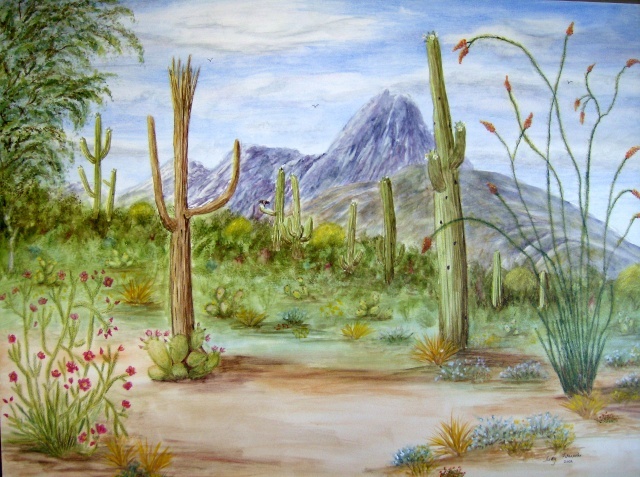 I have this wonderful watercolor I did several years ago of the desert near my house, but I have always felt it needed a mare and foal in the foreground. It is done on a rigid clayboard for watercolor. Has anyone ever tried adding WMO over a watercolor? I figure the fixative has sealed the painting, and then I was thinking about putting a clear coat acrylic spray over it before wiping on a thin coat of walnut oil over the entire surface, so I can paint the horses and highlight where I want to. Any input would be appreciated so I don't ruin the painting. Frankly.....I don't know, never having tried it. I would suggest trying it on another painting (perhaps a binner) before you try it on one you value. I think it would work but I'm really just guessing. Watercolor is a safe medium to put underneath oil paint. The oil will penetrate the watercolor, essentially turning the watercolor layers into oil paint." I'm with Henry though I think it would be a good idea to test it out first on something not so important. Using as an underpainting will work but where you don't want the underpainting altered as in this painting, I would think you would want some kind of barrrier. I've got to see if i have a small clay board and fixitive to experiment on. It has been quite a few years since I did watercolor. You might have problems with the oil paint beading up if the fixative is sprayed on thick. I've also tried oils on claybord directly in the past and the surface is a bit too porous for my taste. Otherwise, it shouldn't be much of a problem. Using walnut oil shouldn't really be necessary and might disturb the watercolor paint. If you were wanting to paint oils on watercolor paper that would be a different story, since the paper would need more sizing protection than the fixative would offer. The experiment has begun. I got a 5 x7 piece of clayboard and painted it with multiple colors using water color. I then sprayed it with two coats of a clear poly acrylic. Dave, I will be using the thin coat walnut oil as a binder. I had watched Jerry Yarnell paint wso over acrylic and that is what he recommend to help the paint adhere better and to make it flow easier over the acrylic. Here is the starting photo. Now comes the hard part. 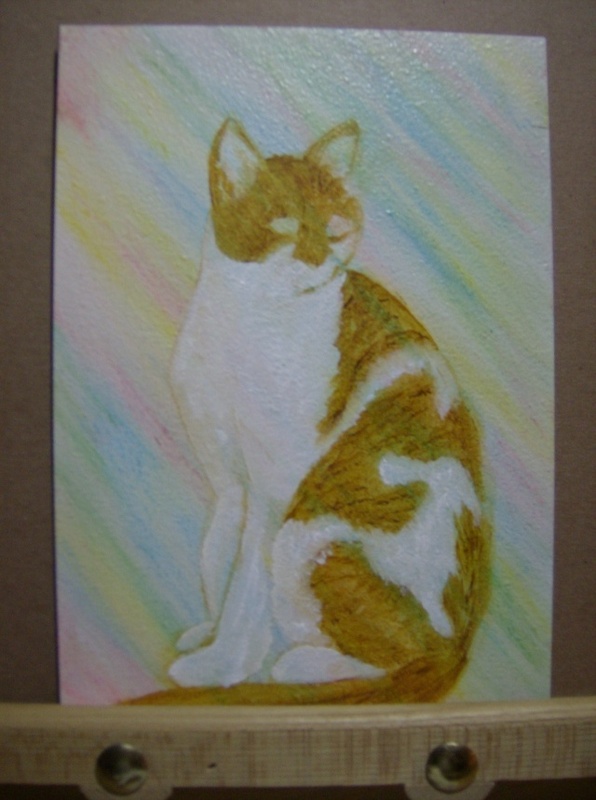 I hate wasting a painting just to experiment, so I am going to paint my kitten Mozart from the RIL I posted. Here is the under painting of Mozart. I applied a thin coat of the walnut oil and then painted in the outline with raw sienna. Having the oil layer under it made it very easy to make corrections as a sketched. I could just wipe it off with a paper towel and not disturb the sealed background at all. The most exciting part of this whole deal, for those of you who have followed me previously, I did this all with my right hand which just came out of a cast 4 days ago after having carpal tunnel surgery two weeks ago. I had not pins and needles while holding the brush so it was great. Amen! I'm back to my painting. Judy, Mozart is looking great! So glad to hear that you're able to paint now. Thank you for sharing your process with the underpainting! Here's the next progress photo. You'll notice, I changed the shape of the tail. The next morning, I put a little walnut oil on a paper towel and wiped the end of the tail off. It came off easily and the sealed background was undisturbed..YEH!! I still have work to do, especially on the face, but I have to let the paint dry a little first. It should be ready the day after tomorrow. This process is so fascinating and I almost cried when I read you used your "new" hand!! And no tingling! Oh, how wonderful! And Mozart looks so alive and real. I guess it's because he is a subject you know deep down. I hope I can catch the emotions in his eyes in the final version. I love doing eyes in animals and people because they always say so much. I love my "new hand". I'll look forward to Mozart's eyes! They tell all don't they! Here is Mozart all finished. I added some WSO over the water color background in some areas of the background to bring up the color. This is something I would definitely do again. I always seem to do better with backgrounds with watercolors and I love some of the special effects you can get using things like salt sprinkled in the wet paint. But I love WSO's for the detail I can accomplish. Next I have to get brave enough to start putting the horses into the original watercolor I asked about at the beginning of this thread. Judy, Mozart looks great! I'm glad the process worked well. Good luck with putting the horses into your other painting. I'm glad the process worked so well. I'm looking forward to seeing the horses when you paint them. I'm still trying to figure the postures and number of horse that won't like like Ijust stuck the in as an after thought. I checked out your website and you do a fantastic job with horses. I have some video of yearlings in a field by my sister's house in S. Carolina. I'm going to look at that and grab stills of some that might work in the painting. Taking them from the video will give me the opportunity to get exactly the postures I want. Some were grazing while others were running through the field. Hi Judy - you must have me mixed up with someone else because I've never painted a horse in my life. Grabbing stills from the video sounds like a great idea. I must have looked at someone else's. I'll have to look at my history and see who it was. I have looked at your website also and like the variety of paintings. I especially like the two Ucluelet tree paintings. Thanks Judy, I was very happy with those tree paintings too. I thought it must have been her when I read her post about horse pictures. I hope there will be some you can use. Judy - thanks for the experiment/info. I've always sprayed fixative over pencil sketches before painting over them. 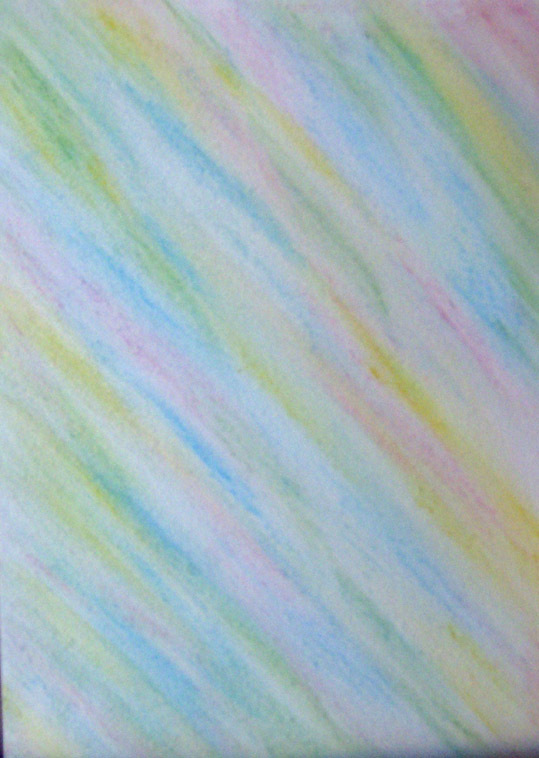 I switched to watercolor pencils a few years ago, and never thought to use fixative on them - Duh! 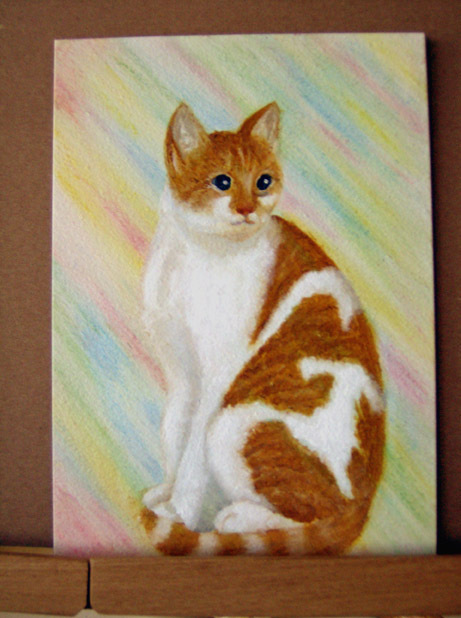 Subject: Re: Can you use WSO over a watercolor that has fixative on it?